• FASHIONABLE AND POSABLE with long, thick hair perfect for brushing and styling. •MULTICULTURAL DOLLS reinforcing that every child is an Everyday Princess®, everyday, everywhere. Neat-Oh! knows that every little girl is a princess, every day. The Unity Doll Set is part of Neat-Oh!’s line of Everyday Princess® products. They’re toys developed to encourage imaginative play – and to empower young girls to design and control their own creative realm. 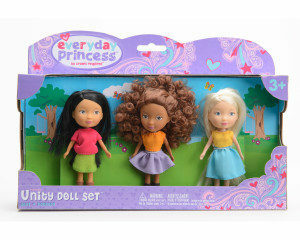 Everyday Princess® Unity Doll set includes 3 beautiful, 4.5″ posable dolls – Ava, Lisa and Haley. This 3-doll set reinforces that every little girl is a princess, everyday, everywhere. Ava, Lisa and Haley are 4.5” tall posable and have thick long beautiful hair perfect for brushing and styling. They are new collectibles in the Everyday Princess® Line, along with Bianca, Emma, Haley, Sophie, and Julia. ● Made from highest-quality, durable, easily-cleaned materials.